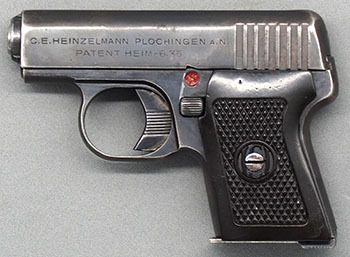 The Heim pistol, made by the C. E. Heinzelmann company of Plochingen am Neckar, Germany, is an unlocked breech 6.35 mm pistol of unusual and innovative design. 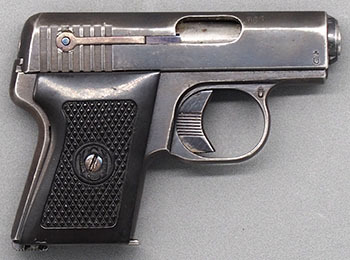 It is sometimes linked with the Mauser WTP pistol, and it does show some design influence from the WTP but contains several features not seen in the Mauser. Interestingly, Weaver, Speed, and Schmid in their book Mauser Pistolen state that the patent for the WTP barrel retention method was purchased by Mauser from C. E. Heinzelmann, the maker of the Heim pistol. I have not been able to verify this, but it wouldn’t be out of the question for employees of the two companies to have known each other, as Plochingen and Oberndorf are both on the Neckar River, about fifty miles apart. I searched for information about C. E. Heinzelmann, but there isn’t much. Der Waffenschmied, the German journal for gunsmiths, reported in their 25 September 1925 issue that the Carl Emil Heinzelmann weapons factory of Stuttgart had opened a branch in Plochingen am Neckar, and in the 25 November 1925 issue they reported that a branch office of the proof office had been established in Plochingen because of the Heinzelmann company. But a search of the next ten years of the magazine does not turn up a single mention of Heinzelmann, nor is there any mention of the products made in Plochingen. I would be very grateful to hear from anyone who can provide more information about the C. E. Heinzelmann company or the Heim pistol. There are three German patents for the Heim, filed by Johannes Heim in 1924 and granted in 1926. 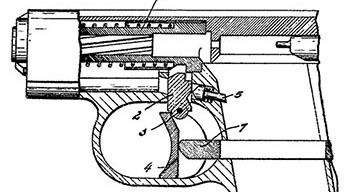 The patent drawings show a gun exactly like the one we examine in this article, which indicates to me that Heim had a working prototype from which the drawings were made at the time the patents were filed (15 November 1924). It appears that few if any changes were made to the design after the patents were granted. Hogg indicates t hat the Heim was probably made in the early 1930’s, but I think this was just a guess on his part. Based on the patent dates and the establishment of the factory late in 1925, it is much more likely that the gun was made sometime around 1926 or 1927. The first patent is German patent 424529, filed 15 November 1924 and granted 27 January 1926. This patent covers the method of barrel retention. A vertical pin attached to the top of the trigger retains the barrel. The pin is tensioned by a spring and plunger. When the trigger is pulled down, the pin releases the barrel and the rear of the plunger is forced into the magazine well. If the magazine is in the gun, it blocks the pin, locks the trigger in place, and prevents removal of the barrel--a well designed safety interlock. This is a well-designed and functional indicator that is much more useful than a mere cocking indicator. The third is German patent 437959, filed 15 November 1924 and granted 1 December 1926. 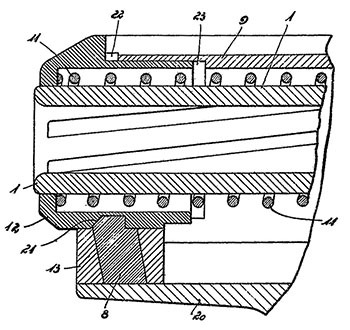 This patent covers the barrel bushing that retains the barrel. The bushing is held in place by a pin in the front under-lug of the slide. The pin is completely covered by the forward frame extension as long as the slide is on the frame. When the slide is removed, pushing in on the bushing forces the pin down slightly so that it can be grasped and pulled the rest of the way down, thus freeing the bushing and allowing removal of the barrel and recoil spring. The guns are of similar size, with the Mauser barrel and slide about 1/4 inch longer than the Heim. The Heim is about a half-ounce lighter. Both guns have a Browning-style stirrup- shaped trigger bar that runs on either side of the magazine to connect the trigger and sear. Both guns have a pin that secures the barrel on the slide from the bottom. The Mauser’s pin blocks the trigger bar when it is pulled down for barrel removal, whereas the Heim’s cannot be activated with the magazine in the gun. In other words, both guns have a safety interlock that prevents the gun from being fired when the barrel is being removed. Neither gun can be disassembled with the striker cocked. Both guns have a movable ejector. The Mauser’s ejector is spring tensioned, but the Heim’s is not. Both are pushed upward and into position when the magazine is inserted. Both guns have a manual safety that locks both the sear and the slide, but the Mauser’s is above the left side of the grip while the Heim’s runs underneath the left grip. 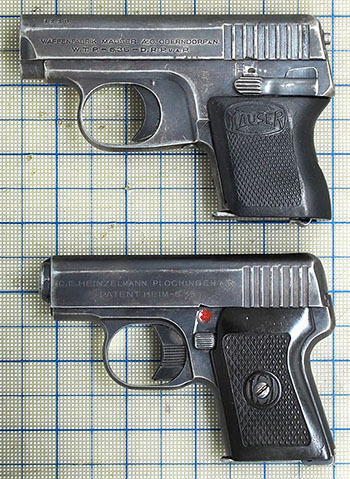 Both guns have a magazine follower that locks the slide open after the last cartridge has been fired, but the Mauser closes the slide as soon as the magazine is withdrawn, whereas the Heim locks the slide open as the magazine is withdrawn and closes it when a fresh magazine is inserted. The magazine follower on the Heim is very reminiscent of that on the Mauser New Model 1910 (1910/14), however the mechanism that locks the slide is different. Most features of the Heim pistol have been described adequately in the section on patents. The one feature that remains unpatented and undescribed is the slide lock mechanism. 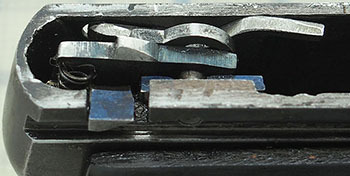 The mechanism interfaces with the right rear portion of the magazine. 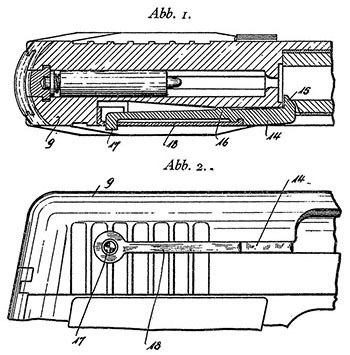 When the magazine is withdrawn the entire mechanism drops down about 1.5 mm, drawing a wedge down into the path of the slide and locking it open. This wedge is the upper portion of a bar that runs down through the grip frame and emerges at the bottom of the gun just next to the magazine release. A tab of metal extends out from the base of the bar. If one wishes to close the slide without inserting a magazine, one can press on this tab with the magazine baseplate and the locking wedge will be pushed upward, freeing the slide. If the magazine is removed with the slide closed and the slide is drawn back it will lock open and will close again when the magazine is reinserted. I put a cartridge in the chamber on the gun shown in order to photograph the loaded chamber indicator with the pin depressed, but there was no change to the loaded chamber indicator. This feature does not work on this specimen. It appears to be a design failure. C. E. HEINZELMAN PLOCHINGEN A.N. The right side of the slide is blank except for the crown over U proof. The serial number is stamped on the curved portion of the slide just in front of the ejection port and on the frame beneath the right grip plate. The grip plates are either plastic, hard rubber, or bakelite. I would guess an early form of plastic, but I don’t know for certain. The magazine baseplate is rectangular, with a small open space at the rear, such that the bottom of the magazine tube forms a small lip. The magazine release fits underneath this lip rather than underneath the baseplate of the magazine. 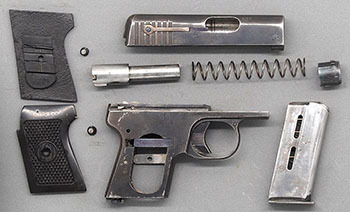 The Mauser HSc uses a nearly identical mechanism. There are two slots for viewing cartridges on the right side. Make certain the magazine and chamber are empty. Pull the trigger and withdraw the magazine. With the slide removed from the receiver, press in on the barrel bushing. The pin on the bottom of the slide should drop down about half a millimeter. While holding the barrel bushing in, grasp the pin with your fingernails or a small pliers and pull it out about one millimeter further. This will release the bushing. Remove the bushing, barrel, and recoil spring from the slide. Pawlas, Karl R. Pistolen Atlas. Nuernburg: 1970. Special thanks to David Rachwal of Handguns of the World for allowing me to study this pistol. Special thanks to Stefan Klein for research assistance.